GfK EMO Scan can capture emotional reactions in real-time with automatic facial expression analysis. The instrument does not have any annoying cables; you only need a webcam, and the results are intuitive to understand. Facial expression analysis is an ideal complement to conventional surveys in order to recognize emotional reactions that respondents are not consciously aware of, do not remember or cannot or do not want to articulate. With the GfK EMO Scan, the creative process of producing an advertising film can be objectively evaluated, facilitated and optimized. GfK EMO Scan – a research project that won the German Market Research Innovation Prize. Emotions are spontaneous reactions, for example, to commercials or products. And because emotions also always have a social function, they are reflected in facial expressions. This is how other people recognize what we are feeling at the moment. The GfK EMO Scan can capture emotions in real time without biases resulting from subsequent surveys or annoying cables. The only things required to find out the emotional reaction to a commercial or product are a webcam and Internet connection. EMO Scan tracks important facial regions such as the eyes and corners of the mouth and interprets changes in these regions in terms of how agreeable or disagreeable the current experience is. The GfK Verein developed the software together with the Fraunhofer IIS in Erlangen and emotional psychologists at the University of Geneva. It recognizes the slightest changes in the face, measures the movements and correlates them on the pixel level with the facial expressions stored in the database. The facial expression reader has been market-ready since the beginning of 2012 and launched worldwide for the testing of commercials (further areas of application are being planned). 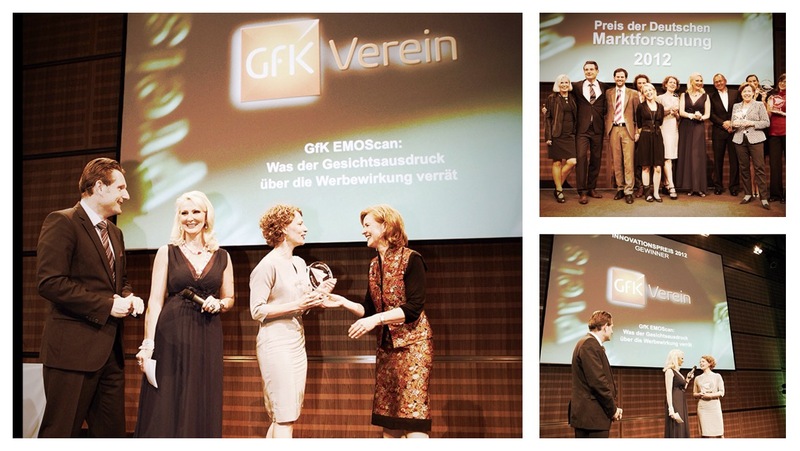 Almost simultaneously, the GfK EMO Scan won the German Market Research Innovation Prize. The GfK Verein is currently working on further development of the instrument together with its cooperation partners. Automatically recognizing emotions: The GfK Verein developed the GfK EMO Scan together with the Fraunhofer IIS and the University of Geneva.The software recognizes even the slightest changes in facial expressions and interprets them. For this, the GfK Verein was awarded the German Market Research Innovation Prize in 2012.